Community Connectors is a feature for Data Studio that lets you use Apps Script to build connectors to any internet accessible data source. Community Connectors are built by the Data Studio community. That means anyone can build Community Connectors. You can also share Community Connectors with other people so they can access their own data from within Data Studio. Why did you choose this codelab? I am interested in data visualization in general. I want to learn more about Data Studio I want to build my own Community Connector. I am trying to integrate Data Studio with another platform. I am interested in Google Cloud solutions. How do you plan to use this codelab/tutorial? How would you rate your familiarity with Data Studio? Never heard of it I know what it is but I don't use it. I use it regularly. I am an expert user. What best describes your background? You can move to the next page to submit the survey information. Data Studio Community Connectors enable direct connections from Data Studio to any internet accessible data source. You can connect to commercial platforms, public datasets, or your own on-premise private data. Community Connectors can fetch data through Web APIs, JDBC APIs, flat files (CSV, JSON, XML), and Apps Script Services. Let's assume you have published a package on npm and you want to track the download count of the package over time by day. In this codelab, you will build a Community Connector that fetches this data from the npm package download counts API. Then you can use that Community Connector in Data Studio to build a dashboard visualizing this data. You can resume the codelab after watching the video. There's no need to memorize this workflow, just have a look to get a sense of what happens in a connector. You can always come back to this diagram. In the next step, you will start creating your connector in Google Apps Script. You will have to switch back and forth between the Apps Script UI and this codelab. Step 1: Visit Google Apps Script. Step 2: Create a new apps script project by clicking "+ New script" in the top left section. You will see a shell project with a blank myFunction function in the Code.gs file. Step 3: Delete the myFunction function. Now you will start writing your connector code in the Code.gs file. Data Studio will call the getAuthType() function when it needs to know the authentication method used by the connector. This function should return the authentication method required by the connector to authorize the 3rd-party service. Here, you are indicating that your connector does not require any 3rd-party authentication ('type': 'NONE'). To see all supported authentication methods, view the AuthType() reference. Users of your connector will need to configure the connector before they can start using it. With the getConfig() function response, you can define what configuration options users will see. Data Studio calls the getConfig() function to get the connector's configuration details. Based on the response provided by getConfig(), Data Studio will render the connector configuration screen and change certain connector behavior. A dropdown for single-select options. A dropdown for multi-select options. A single checkbox that can be used to capture boolean values. A static plain-text box that can be used to provide instructions or information to the user. Use the INFO element to provide user instructions and a TEXTINPUT element to get the input package name from the user. In the getConfig() response, you will group these form elements under configParams key. Since the API you are connecting to requires date as a parameter, you will set dateRangeRequired to true in the getConfig() response. This tells Data Studio to provide date ranges with all data requests. If your data source does not require date as a parameter, you can omit this. Based on these configParams, when you use the connector in Data Studio, you can expect to see a configuration screen like the following. But more on that later. Let's move on to the next function - getSchema(). Data Studio calls the getSchema() function to get the schema associated with the selected configuration for the connector. Based on the response provided by getSchema(), Data Studio will show the fields screen to the user listing all the fields in the connector. You can review the getSchema() and Field reference later to learn more about this. Depending on how you are getting the data for your connector and the configuration provided by the user, the schema may be fixed or you may have to dynamically create the schema when getSchema() is called. Configuration parameters from getConfig() that are defined by the user will be provided in the request argument for getSchema() function. For this codelab, you do not need to access the request argument. You will learn more about the request argument when you write code for the getData() function in the next segment. 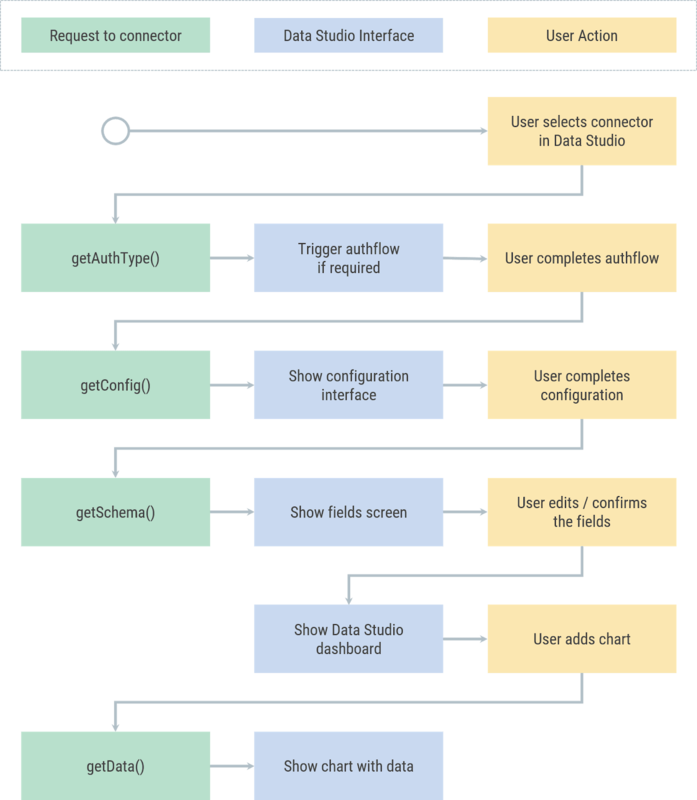 Based on this schema, you can expect to see the following fields in the Data Studio fields screen when you use the connector in Data Studio. But more on that later when you test your connector. Let's move on to our last function - getData(). There's no need to copy any code from this page since you will copy the completed getData()code in a later page. Data Studio passes the request object with each getData() call. Review the structure of the request object below. This will help you to write the code for your getData() function. The configParams object will contain configuration parameters from getConfig() that are defined by the user. The scriptParams object will contain information relevant to connector execution. You do not need to use this for this codelab. dateRange will contain the requested date range if requested in getConfig()response. fields will contain the list of names of fields for which data is requested. For this getData()call, in the above request, only two fields are being requested even though the connector schema has additional fields. The next page will contain the example response for this getData()call as well as the general getData()response structure. In this codelab, we are not using the request parameter for getSchema(). For getSchema(), the request parameter will contain only configParams and scriptParams. There's no need to copy any code from this page since you will copy the completed getData()code in the next page. This is the structure of getData()for your connector. This is how you will be subset the schema for requested fields. Here, you can see that request.fields contains the list of field.name for requested fields. You will be first creating the URL for the API using the request.dateRange.startDate, request.dateRange.endDate, and request.configParams.package provided by Data Studio. Then you will be fetching the data from the API using UrlFetchApp(Apps Script Class: reference). Then your will parse the fetched response. You will transform the response from the npm API and provide the getData() response in the following format. If this format is unclear, have a look at the example response in the following paragraph. You have already made the subset of the schema. You will use the following function to transform the parsed data and filter it down for requested fields. You are done with the Code.js file! Next, you will update the manifest. In the Apps Script editor, select View > Show manifest file. This will create a new appsscript.json manifest file. Save the Apps Script project. Congratulations! You have built your first community connector and it is ready for a test drive! Step 1: In the Apps Script development environment, Click on Publish > Deploy from manifest to open the Deployments screen. The default deployment, Latest Version (Head), will be listed Here. Step 2: Click on the deployment name or the Data Studio icon next to the Get ID link. It will reveal the direct connector link into Data Studio for this connector. Step 3: Click on the newly available connector link. It will open up a new window in Data Studio. First time Data Studio users: If you have not used Data Studio before, you will be asked to authorize Data Studio to your account and agree to the terms and conditions. Complete the authorization process. When you first use Data Studio, you may also see a pop-up that asks to update your marketing preferences, go ahead and update them. You should sign up for the Product announcements if you want to know about the latest features, updates, and product announcements by email. Now, you will see a prompt to authorize the new connector. Click Authorize and provide the required authorization to the connector. Once the authorization is complete, it will show the configuration screen. Type in "lighthouse" in the text input area and click Connect in the top right. You will see the fields screen. Click Create Report in top right. You will be in the Data Studio dashboard environment. Click Add to Report. In Data Studio, every time a user access a connector and add a new configuration, a new data source is created in the user's Data Studio account. You can think of a data source as an instantiation of the connector based on a specific configuration. Based on the connector and the configuration the user had selected, a data source will return a data table with a specific field set. Users can create multiple data sources from the same connector. A data source can be used in multiple reports, and the same report can use multiple data sources. Time to add a Time Series Chart! In the menu, click on Insert > Time Series. Then drag a rectangle in the canvas. You should see a time series chart of the npm download count for the selected package. You can then add a date filter control and view the dashboard as shown below. That's it! You just tested your first community connector! This brings you to the end of this codelab. Now, let's see what next steps you can take. In Data Studio, if you do not provide a package name in the configuration screen for your connector, you will see an error message when you draw the time series chart. Try adding input validation or a default option to your connector config. Try adding support for querying multiple package names at the same time in your connector config. Hint: The npm package download counts API supports input of multiple package names separated by comma. You can find solutions to both of these in the deployed version of the npm connector. View reference for the connector API and the manifest. Explore example connector code in our Open Source Repository to understand best practices. Complete the clasp Codelab so that you can develop Community Connectors in your local environment. Once you have built a complete Community Connector, consider publishing options. Build a Community Visualization for Data studio. Below are various resources you can access to help you dig into the material covered in this codelab more.